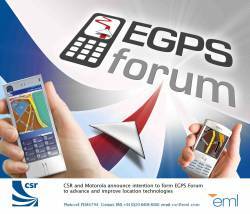 The Enhanced GPS Forum (EGPS Forum) will initially focus on evaluating hybrid technologies that combine satellite-based positioning with timing measurements taken from cellular telecommunications networks to provide location information, even indoors. It will also address the issue of establishing the underlying infrastructure to ensure full interoperability of this technology, with a primary focus on portable devices incorporating wireless communications. The EGPS Forum will be open to handset manufacturers, location technology companies, network infrastructure providers and mobile network carriers. According to its organizers, the group is committed to meeting consumer and regulatory needs for precise and consistent levels of location information. The companies expect a procedure for EGPS field trials and performance testing will be in place in the first half of this year. CSR’s participation in the forum reflects its acquisition in early 2007 of NordNav Technologies AB, a Swedish provider of software GNSS receivers, and Cambridge Positioning Systems Ltd., a UK company that had developed a telecom network-based positioning technique. Motorola provides a range of cellular phones, communications infrastructure, enterprise mobility solutions, and other mobile devices. 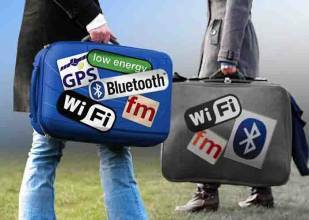 A global provider of personal wireless technology, CSR’s product portfolio covers Bluetooth (BT), FM and Wi-Fi (IEEE802.11) in addition to GPS. The company recently announced a collaboration with Samsung Electro-Mechanics Company (Samsung) to produce embedded OEM GPS solutions based on CSR’s GPS software and Samsung’s module hardware. The 9.8×9.8×2.15-millimeter Samsung module provides a GPS RF subsystem based on SiGe Semiconductor’s SE4120S RFIC and includes voltage regulation, real-time clock (RTC) and temperature compensated crystal oscillator (TCXO), surface acoustic wave (SAW) filter, and low-noise amplifier (LNA). When combined with CSR’s GPS software running on a typical applications processor, the system reportedly achieves tracking sensitivity of -159 dBm and has a cold start acquisition time of under 40 seconds. “The Samsung module is one we’ll be using for several software products we plan to bring out between now and the time our own GPS+BT silicon is ready for mass production, including the E5000,” CSR’s Location Business Unit Vice President, Stuart Strickland, told Inside GNSS.